Review: Based on the book Deep Down Dark, narrative journalist Hector Tobar’s weaving together of the firsthand accounts from the men who were there, The 33 is a drama in real life story that has its heart in the right place. The whole world was riveted by the plight of the Chilean miners trapped 2,300 feet below the ground by a cave-in for 69 long days. As the country watched, an international rescue team was assembled to devise a way to get to the men before time and food runs out. Anyone that’s picked up a newspaper or watched the news during that time knows how it all ended, but the details were a bit cloudy for me five years later which added to the dramatic tension the movie builds nicely. I told someone after the movie that I thought it was “mostly good” because for all of the genuine emotion and heroism captured on screen, there was a strange disconnect that comes out of the film being watered down and becoming more traditionally American-ized than it should. I was surprised at how clearly divided into three acts the movie was, with the traditional climax happening about 3/4 of the way through the film. There seemed to be a carefully rendered formula to every new development that presented itself to the men below the surface and the government officials, family members, and rescue crews racing against the clock to save the trapped workers. I also found myself really wishing that the Chilean film was entirely in Spanish. All of the signs and news report headings were in Spanish yet the actors almost uniformly speak English with a fair to decent accent. Something that always annoys me is when a movie takes the time to subtitle actors speaking in a foreign language only part of the time. Here, a song of hope and pain starts off with an English translation before the subtitles disappear – perhaps it’s a way to provide a bridge between two cultures but it can come off as slightly manipulative with the filmmakers only translating information they want you to know. Attracting high-profile talent, the film has a wealth of strong performances. Though he’s billed a bit far down in the credits, Lou Diamond Phillips has perhaps the best, most moving arc as a miner who worked his way up to management, knowingly making concessions along the way that comes back to haunt him. Phillips is one of the last people you see in the movie (before it breaks to a roll-call like credits sequence that should leave a lump in your throat) and he makes a significant impression. Also impressive is Juliette Binoche (Godzilla) who convincingly masters the language (though her French slips in every now and then) as a strong-willed family member of a trapped miner and Antonio Banderas (The Expendables 3) who is better here than in any movie he’s made in over a decade. Rodrigo Santoro (The Last Stand) is notable as a government official with a conscience while James Brolin and Gabriel Byrne pop up for some histrionically dramatic scenes. The Irish Byrne, it must be noted, totally gives up on his Spanish accent well before the movie reaches its conclusion. 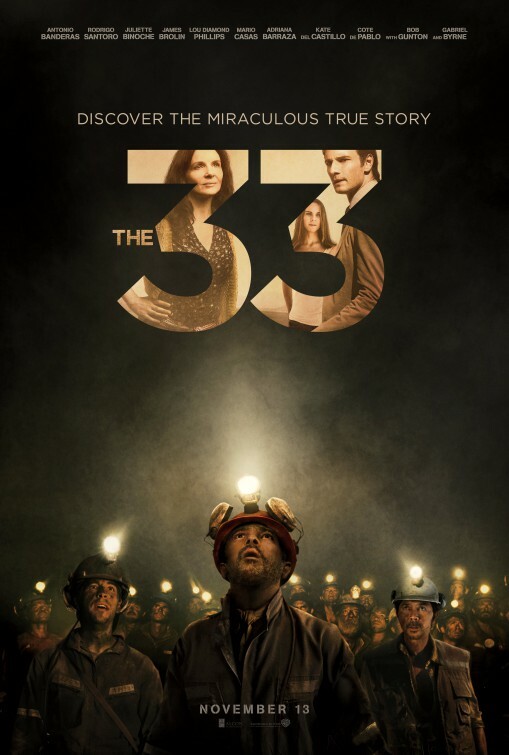 Not a movie delivered on an epic scale, The 33 is nonetheless a powerful tale of the human condition and the strength to continue on in the face of terrible odds. Worth digging into.